Hello Sweet Cheer: Weekend Update: On a Tuesday! My weekend was superb! On Friday I got my phone switched out! Now my lock button is in full functioning mode! It actually makes a big difference so I'm happy to have it fixed. Saturday I slept in a little later than I desired and then my family and I started cleaning house! You see, we were preparing for guests! 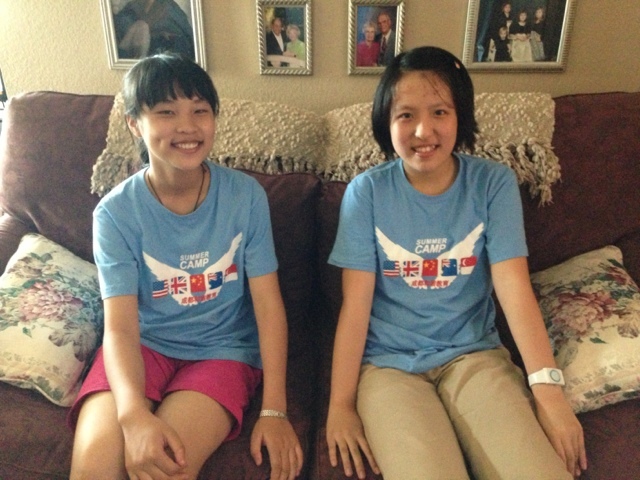 For the next three weeks we are hosting two Chinese girls at our home. My parents' church does a program called China Camp where students come and take lessons, learn about Texas and the US, go on field trips, etc. This week they go to the church every day for lessons, games, and hanging out with their friends. Next week they'll go to a sleep away camp where they'll learn all about the different holidays we celebrate here. The week after that they'll go on a bunch of field trips to fun places in the Dallas area! Anyway, the girls staying with us are Candy (14) and Linda (13). They are so sweet and we've loved having them so far! We're getting to know them and can't wait to show them around McKinney this weekend! So that's pretty much what Sunday consisted of...church and then waiting for the girls to get here! I'm off for the rest of this week so I'm hoping to be productive!